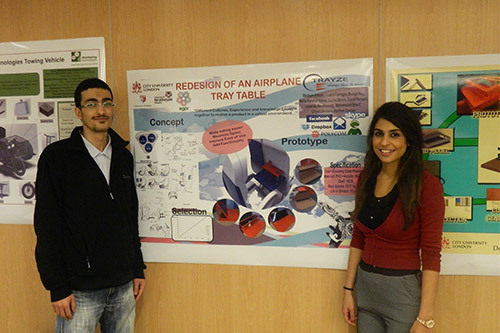 BEng/MEng students lauded for high standard of displays in City's engineering poster competition. Team 'Formula Student Powertrain' emerged victorious on 24th January during the poster competition for 3rd and 4th year BEng and MEng engineering students in the Oliver Thompson Lecture Theatre. The winning students (Andreas Assiotis, Fawwaaz Hosein, Xi Yuan, Kwame Sarfo and Efthimis Tzavoulis) gave a clear and cogent explanation of their poster which detailed the powertrain system of the Formula Student City Racing car. 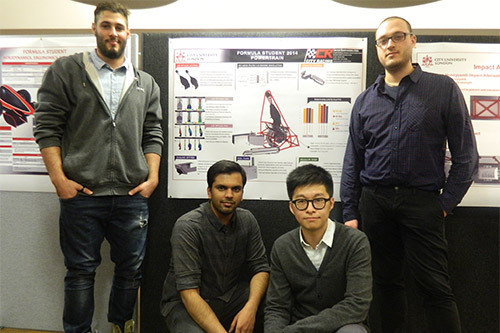 Team 'Aerodynamics, Ergonomics and Electronics' (Tommy Steinacher, Alberto Bonifacio, Andres Taylor, Manu Prakash, Belaal Mughal and Michal Dybowski) was the Second Prize winner. 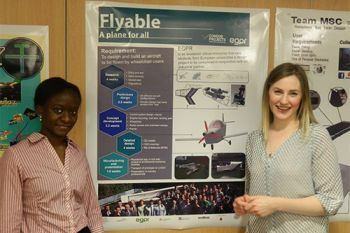 Joint Third Prize winner was awarded to Team Flyable (Sara Linda and Katherine Frost) and Team Trayze (Mohammed Sharif and Resham Advani), who are also all participants in the European Global Product Realisation (EGPR) programme. "The standard of competition during this year's poster competition was very high. It is always good to encourage students from across the spectrum of engineering disciplines to pool their ideas and concepts and create platforms for creative partnerships. In engineering, technical savvy is just as important as the ability to communicate and market one's work. 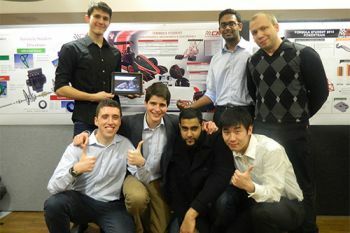 This year's competition gave BEng and MEng students an excellent opportunity to develop these strengths". Chris Gaskell, one of the competition's judges and an outstanding recent City engineering alumnus, gave a brief presentation to students about careers in engineering. Chris is employed by Torotrak. Other judges were Dr Andrew Court of PA Consulting and John Stevenson, Senior Communications Officer in the School of Engineering and Mathematical Sciences/School of Informatics.